Pink eye is characterized by pink to brown blotches on the skin, usually around the eyes at the apical (bud) end of tubers. When the disease is severe, a shallow, reddish brown rot occurs beneath the discolored areas. Pink eye is often prevalent on varieties such as Kennebec and Superior, which are highly susceptible to verticillium wilt, and commonly occurs during and after a wet harvest season. As a rule, the disease is not commercially serious in tablestock or seed potatoes stored under cool, relatively dry conditions. Tuber appearance may be somewhat marred, but the affected skin and superficial rot usually dry up. However, in the case of chipstock held at warm temperatures and high relative humidity, pink eye often opens the door to secondary soft rotting bacteria, which frequently cause extremely heavy losses. Pink eye is caused by a bacterium, Pseudomonas marginalia, which lives in the soil on dead organic matter. Under moist conditions at the end of the season, the bacterium invades tubers, which show symptoms after they are harvested. As far as is known, Pseudomonas marginalia is not seedborne. 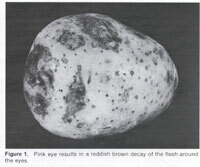 The pinkish brown blotching mentioned above shows up readily on moist, freshly dug tubers, but is usually difficult to notice on dry, unwashed potatoes. In severe cases, a reddish brown decay extends a few millimeters (2-3) into the flesh. The rot may be confused with that caused by late blight, but it is not granular and is more superficial than the latter. If tubers are kept cool and dry, the only symptom commonly encountered is scaly, flaky skin over the affected areas. However, tissue weakened by pink eye is often invaded by soft rotting bacteria if potatoes are held at warm (above 45° F) temperatures and high relative humidity. The end result is often the slimy, foul-smelling decay typical of bacterial soft rot. Unexpectedly wet weather obviously cannot be circumvented in humid areas such as the Northeast. But selection of well-drained soils will help to reduce the effects of excessive rains. In irrigated regions, restriction of soil moisture at the end of the growing season is feasible and to be recommended. Because of the frequent correlation between pink eye and verticillium wilt, it is wise to avoid planting highly pink eye susceptible varieties on fields that have a history of serious wilt problems. Wilt-resistant varieties should be resorted to if land availability prohibits such a choice. If possible, tubers should be kept cool and dry after harvest to prevent further development of pink eye and secondary soft rot problems.